This year, 2014 (100 years since my mother was born), will be a big Doris Day time for me. I'll be in Carmel with Doris in early April for her 90th Birthday celebration. There's many activities planned, and I'm sure it will be a great group of fans from around the world. On May 15th, I'll be sailing with the Crystal Cruise Line for their "Doris Day Cruise." Two weeks, and more, from LA to NY City, via the Panama Canal … with a whole entertainment division focusing on all things Doris Day. I'll be talking and sharing all things Doris with the passengers. All this preparation fills me with memories of our time together. Not just the last two years of "The Doris Day Show," but the decades following when we were crusading for Animal Welfare with Actors and Others for Animals. In 1971, it was early in the last season when Doris and I joined Richard Basehart and his wife Diana … along with a small dedicated group of people to launch "Actors and Others for Animals". Our purpose was to elevate the public sensibility concerning the treatment of animals. At that time, animal activists were thought of as laughable, stereotypical old ladies in tennis shoes. We felt that the public would have a different kind of respect, for messages and information about pets, from actors that they admired. Doris gathered her famous friends and we had a fund raiser at my kid's grade school. Doris was auctioning off star stuff, Lucy was taking Polaroid pictures with the public, and Little Lucie Arnaz was her photographer. We realized we were on to something when l7 thousand people showed up to that little school. In the following years, we did our 'Celebrity Fairs' at the Warner Brothers Studio Ranch. 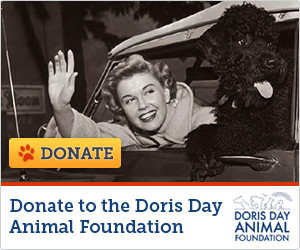 Now, this 2014, we're still going strong, and although Doris now has her own Foundation, she still lends support to Actors and Others for Animals. In the Carmel home, where Doris and her animals live, she lives a quiet, but busy life. 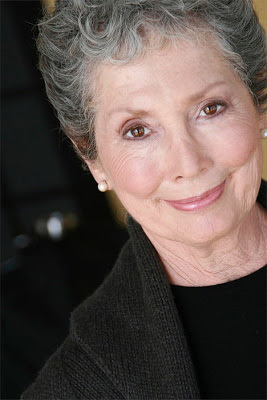 She still loves to laugh and enjoys talking about the times we had on the set of "The Doris Day Show" and the adventures we had helping animals. Doris really broke though the humane barriers and raised the bar for the many advocates for animals. In my mind's eye, I can still see her animals, maybe two or three, sitting on canvas chairs watching the last shot of the day. She always had about 6 of her dogs in her dressing room right off the set. It was like a little cottage, decorated with her sunny taste. One of her favorite treats was a half of cantaloupe filled with Rocky Road ice cream. That's one of my sweetest memories. I had always been a huge Doris Day fan. When I learned that I was cast in The Doris Day Show, it was a dream come true for me. I had a great time working with her and the rest of the cast on the show. Doris was a lot of fun! She introduced me to Rocky Road ice cream! Still my favorite today! Every time I have a scoop (or two), I can't help but think of her! There are so many wonderful things about Doris - her talent as a singer, her talent as an actress, the way she makes you feel like you've known her forever, her tireless work for and love for helping the animals - so many contributions to our world! You are an inspiration to us all! Happy Birthday Dodo with much love from Leroy B. Simpson (Jimmy Hampton). My special gift for Doris Day! I purchased all of her LP's, scanned them, cleaned up the graphics in Photoshop and created a cool poster. It took me a few months and a few hundred hours, but it was well worth it. There is one hanging up in Doris' home, her hotel across from the bar (Cypress Inn in Carmel), her manager has one, but I only printed 10. Of course, my vocalist, Laura Didier, also has one hanging in her home.